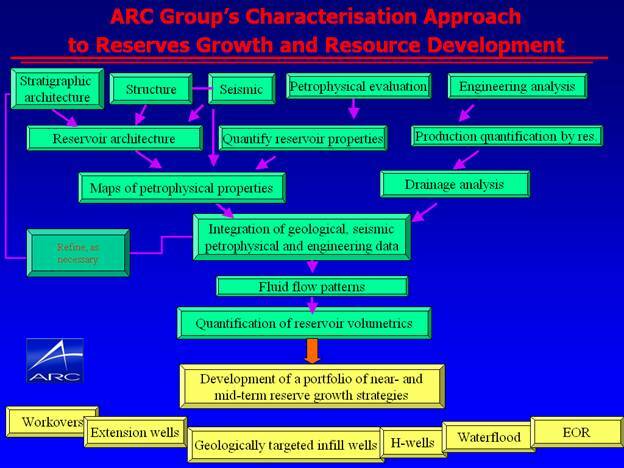 The ARC Group ResQTM services approach has been developed over the past two-and-a-half decades and proven successful in many reservoir characterization studies we have undertaken in Colombia, Venezuela, Australia, Mexico, Suriname, and in the US. The ResQTM services foundation is integration. Integration of advanced reservoir characterization methodologies, including sequence stratigraphy, depositional systems analysis, seismic interpretation, petrophysics, production engineering, and completions optimization. Using the ResQTM services approach carefully planned and strategically executed simulation activities can test technological alternatives to facilitate deployment of a state-of-the art oil and gas exploration and development plans. The objective of ResQTM is to provide upstream management a resource-based quantification of oil and gas fields to use as the basis for long-term planning and cost-effective resource development. Our ResQTM approach for advanced development planning developed over the past two and a half decades is shown graphically below. The foundation of extended development planning is integration. Integration of advanced reservoir characterization methodologies (including sequence stratigraphy, depositional systems analysis, seismic interpretation, petrophysics, production engineering, and completions optimization) with carefully planned and strategically executed simulation activities to test technological alternatives will facilitate deployment of a state-of-the art development plan for the targeted field. The objective of this approach would be to provide the client with a resource-based quantification of the field to use as the basis for long-term planning and cost-effective resource development of the field.